Want proof? According to a study conducted by MarketsandMarkets, the global enterprise video market will continue to grow at a compound annual growth rate (CAGR) of 20.4 percent from 2014 to 2019, at which point it will reach $32.87 billion. There are a number of reasons enterprise video is in such high demand right now, namely due to the fact that video is a highly versatile media type. For instance, you can use video to host interviews with company executives and industry leaders, showcase product reviews, share press conferences or highlight customer use cases. There is virtually no limit to what you can accomplish with the technology. Further, video is highly shareable over social platforms. There’s always a chance that a quality video could go viral and be seen by millions of people. It should also be noted that enterprise video is a great way to supplement other types of marketing assets. You can insert enterprise video clips into blog posts, or offer gated content on your website in exchange for customers’ contact information. So, are you looking to incorporate video into your enterprise’s marketing strategy? If so, one of the best ways that you can get people to tune in besides sharing your content over your social channels is by featuring it in a webinar. In doing so, you can send out invitations to targeted leads, collect real-time feedback from attendees and then follow up with a thank you note or call to action. These reasons are a big part of why video usage during webinars has increased by 7.5 percent from 2013. 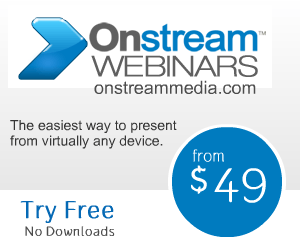 Click here to learn more about how Onstream Webinars can help your brand share enterprise video with your customers!